Does it live up to its promise of making digital-music creation easy? Griffin's StudioConnect unites your iPad with other pieces of music making hardware in your studio. The unit has seven ports in total: headphone out (on the front), 3.5mm stereo in, 1/4-inch audio-in jack, five-pin DIN MIDI in and out, and left/right RCA line-outs (for connecting your sound system). Those five-pin MIDI ports require your gear to be mains powered, meaning that USB-over-MIDI gear won’t cut it. These gripes aside, this gadget delivers everything it promises. Our MIDI keyboard worked perfectly with the GarageBand and Animoog apps, with audio crisp and clear. It was more satisfying to play a real keyboard rather than poke away at the virtual keys on a screen. But we quickly came across a problem when recording vocals. 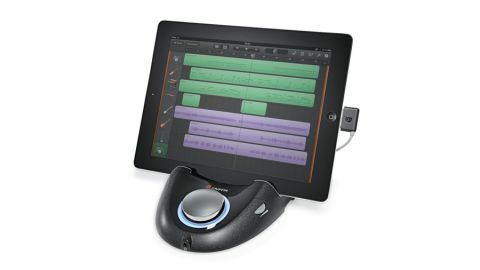 The unit doesn’t offer XLR sockets with phantom power, and there’s no pre-amp, so you’ll struggle to record vox that sounds any better than those gained through the iPad’s built-in mic. A missed opportunity. While the StudioConnect does what it can do well, it doesn’t offer all we’d expect. It’s a good-looking, fuss-free, high-quality way to get MIDI and audio into your iPad’s clutches, and we’d recommend it as long as you don’t plan on recording many vocals.